We continued to work with our corporate clients Grosvenor Estates and KPMG to improve the landscape for honey bees and wild bees. A tour of Kensington Roof Gardens showed them how it’s possible to have 125 trees on a London roof top in just 18 inches of soil providing year round bee-friendly forage. We are passionate about the potential for cities to have more roofs like this to help pollinators and ourselves by increasing flood resilience and reducing pollution. Two roofs high above Canary Wharf are now providing more forage for bees; one large green roof managed by Willerby Landscapes, where we advised on replacing some of the plants struggling in the exposed conditions with other more robust varieties that bees like, the other roof where the hives are located at KPMG now has planters containing year-round bee flowers. And thanks to Alec Butcher, landscape manager at Canary Wharf management, the few green spaces in Canary Wharf are now planted with more pollinator-friendly shrubs and flowers including holly bushes, Pulmonaria and Erysimum bowles mauve. 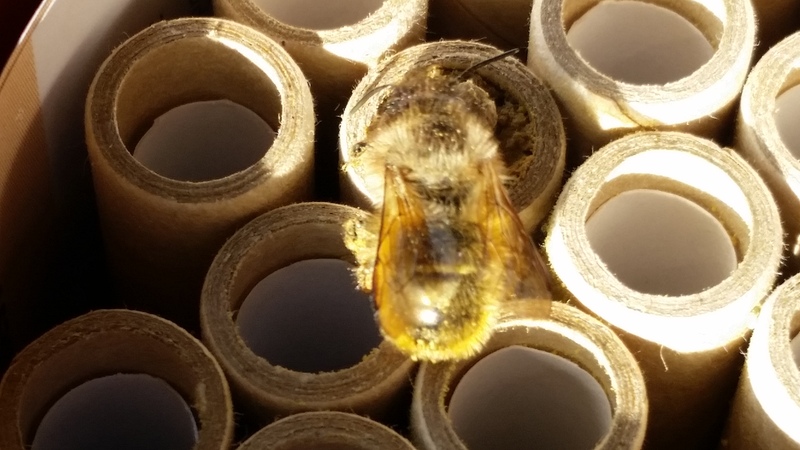 More bee hotels for solitary red mason bees (Osmia bicornis) to nest in are now installed across London, including on the side of our garden shed. We put a bee hotel on the roof at Weils law firm in the City, having worked with the gardener last year to improve the bee forage on the terrace. 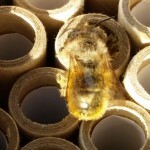 It’s used for events during the summer so isn’t suitable for hosting a hive but the company was keen to learn about how they could help wild bees instead. We gave a talk to staff about what they could do at home to provide shelter and food. We also encouraged KPMG staff at its Watford office to create a bee and bug hotel in their car park. 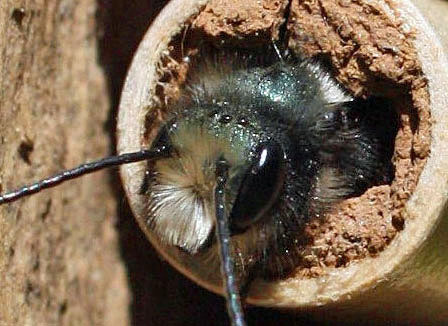 We gave talks and ran workshops throughout the year for corporates and local communities on how to provide better forage for wild bees (including a talk at urban gardening show, GROW ) and how to build your own bee hotel out of recycled wooden organ pipes (kindly donated by St Peter’s Church in Hackney) or out of plastic water bottles and hollow bamboo canes. One of the most enjoyable events was at the Dalston Eastern Curve garden, a weekend of Bees, Butterflies and Blooms for the Chelsea fringe. The brightly painted bee hotels are now proudly displayed on a south facing wall. We hope they will be inhabited this coming spring. As part of the weekend, we created bee ID charts that allowed visitors to spot the different bees they saw. In King’s Cross we continued to work with youth charity, Global Generation. This year, we partnered on a Bees for a Better World project, funded by the Heritage Lottery Fund, which introduced young people to both wild bees and forage around the urban development and on an organic farm in Wiltshire. The HoneyClub KX Bee Trail app, developed by Honey Club members (Urban Bees, Wolff Olins and Global Generation) was the culmination of our educational work around bees and forage. 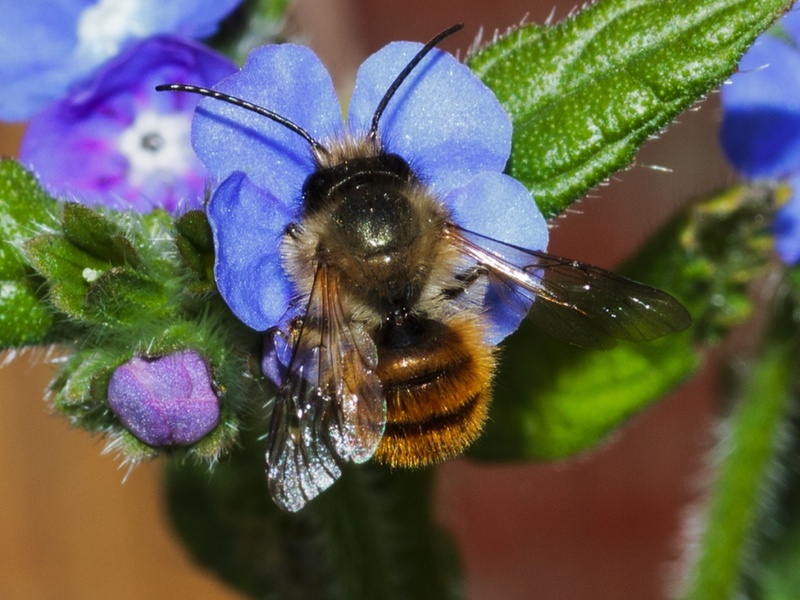 The exciting app allowed visitors during August to tour London’s new development counting four species of bees at a various locations, learning about the forage and bee habitat en route and unlocking vouchers to use at bars and cafes in the area. Thanks to Des Smith, head gardener for Willerby Landscapes on the King’s Cross site, for working with us to map the bee-friendly flowers throughout the year across the development and Argent for supporting the piloting of the app. The Urban Bees apiary continued to flourish at London Wildlife Trust’s Camley Street Nature Park, and we gave LWT volunteers an opportunity to learn more about the workings of a hive and to enjoy the honey that the bees produced over the summer. 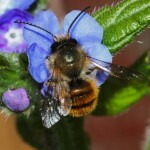 We are also began training corporate beekeepers for a couple of new clients in central London this year. As 2015 draws to a close with unseasonably warm weather in London allowing honeybees to forage over Christmas, and flooding in the north of England, we have to make our cities more resilient. One of the highlights of the year was meeting planting design professor, Nigel Dunnett at the opening of the first rain garden in central London. It’s outside the HQ of the John Lewis Partnership in Victoria where Urban Bees has worked with Victoria BID to train responsible beekeepers to keep hives. The rain garden will capture rainwater runoff from surrounding buildings and slowly release it into soil, to be absorbed by 30 different types of plants and two Italian Alder trees. 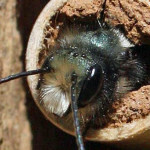 By making cities more bee-friendly by planting more trees and shrubs to feed them and other pollinators, and to act as urban drainage we create a win, win for bees and for us. Thanks to all our partners and collaborators and people that inspired us in 2015. This entry was posted in All blogs on August 31, 2015 by alison.